King Fergus: Pretend I'm Merida, speak to me. King Fergus: [shrilly voice] I don't want to get married, I want to stay single and let my hair flow in the wind as I ride through the glen firing arrows into the sunset. Merida: There comes a day when I don't have to be a Princess. No rules, no expectations. A day where anything can happen. A day where I can change my fate. Merida: [Elinor gestures to Merida's bow on the table] Sorry, I don't speak Bear. The Crow: [arriving at the front gate with carvings, last lines] Delivery! Sign here, sign here... Come on, Birdbrain. I haven't got all day. Princess Merida: Mom, you'll never guess what I did, today! Queen Elinor: What's that dear? Princess Merida: I climbed up the Crown's Tooth and drank from the fire falls. 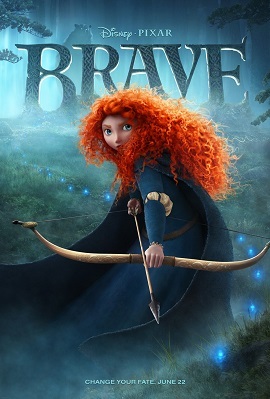 Merida: Mom, it's just my bow! The Witch: Do you not want it? Merida: No! I want it, but... Are you sure if I give this to my mom, it will change my fate? The Witch: Trust me, deary. It will do the trick. Young MacGuffin: [in a thick Doric accent] It's jist nae fair makin' us ficht for the hand o the quine that disnae want any bit o it. Ken? Merida: [after Young Macintosh throws his bow] Good Arm! King Fergus: [Fergus brushes back his hair] And, such lovely, flowing locks. Queen Elinor: Merida, all this work, all the time spent preparing you, schooling you, giving you everything we never had. I ask you, what do you expect us to do? Merida: Call off the gathering. Would that kill them? You're the queen. You can just tell the lords the princess is not ready for this. In fact, she might not ever be ready fir this, so that's that. Good day to you. We'll expect your declarations of war in the morning. Queen Elinor: I understand this must all seem unfair. Even I had reservations when I faced betrothal. Queen Elinor: But we can't just run away from who we are. Queen Elinor: If you could just try to see what I do, I do out of love. Merida: But it's my life, it's... I'm just not ready. Queen Elinor: [after Merida's actions at the clan gathering, Elinor drags and throws Merida into the tapestry room] I don't believe you! I've just about had enough of you, lass! Merida: You're the one that wants me to...! Queen Elinor: You embarrassed them! You embarrassed me! Queen Elinor: You don't know what you've done! Queen Elinor: There'll be fire and sword if it's not set right. Queen Elinor: I am the queen! You listen to me! Princess Merida: OH! This is so unfair! Merida: [grabs a sword and swings it around angrily] You were never there for me! This whole marriage is what you want! Do you ever bother to ask what I want? No! You walk around telling me what to do, what not to do! Trying to make me be like you! Well, I'm not going to be like you! Queen Elinor: Ach! You're acting like a child! Merida: And YOU'RE a beast! Merida: That's what you are! Merida: [sticks the tip of her sword into the tapestry] I'll never be like you! Queen Elinor: No! Stop that! Merida: I'd rather DIE than be like you! Queen Elinor: Merida, you are a princess! Queen Elinor: I expect you to act like one! Queen Elinor: Oh, no! What have I done? Merida: That scaffy witch gave me a gammy spell! Queen Elinor: [as Elinor and young Merida play, Fergus places his bow on the table] Ach! Fergus, no weapons on the table! King Fergus: Not with that. Why not use your very own? King Fergus: Happy birthday, my wee darlin'! Merida: CHOMP! Dad's leg was clean off! King Fergus: Aw... That's my favorite part! Princess Merida: Well, that's attractive. Merida: I am Merida, and I'll be shooting for my own hand. [first lines] Queen Elinor: Where are you? Come out! Come out! Come on out! I'm coming to get you! Queen Elinor: [young Merida laughs as she hides under the table] Where are you, you little rascal? I'm coming to get you! Queen Elinor: [Elinor looks under the table but Merida quickly moves to hide somewhere else] Hmm. Where is my little Birthday girl, hm? I'm going to gobble her up when I find her! Queen Elinor: [Merida comes up behind Elinor and goes to run away but Elinor catches her] Eat you! Queen Elinor: A lady does not place her weapon on the table. King Fergus: Well, that's just grand, isn't it? Guess who's coming to dinner! Merida: I bet he wishes he was throwing cabers. Lord MacGuffin: And all of our teeth! Young MacGuffin: If he was a wee bit closer, I could lob a caber at him, ye ken. Lord Macintosh: And we don't hide under bridges, you grumpy old troll! Lord Dingwall: You want a laugh, eh? The Witch: A grim fate. But what of you? Will you challenge fate? Young Dingwall: [gasps; frightened] I... I just wanted a drink of water! Young Dingwall: Let me out! No, please! The Witch: Sweetie, you've got to pull, not push. Young Dingwall: [calmly opens door] Oh. Thank you. The Witch: [laughs] Nice chatting with you. The Crow: [caws] Back to woodcarving. Merida: I became a sister to three new brothers. The princes. Hamish, Hubert, and Harris. Wee devils, more like. They get away with murder. I can never get away with anything. The Witch: [Exits her house with Merida and her crow, snaps her fingers and opens the door to reveal her cauldron and casting materials within] Never craft where you conjure. Merida: [voice over] Some say our destiny is tied to the land, as much a part of us as we are of it. Others say fate is woven together like a cloth, so that one's destiny intertwines with many others. It's the one thing we search for, or fight to change. Some never find it. But there are some who are led. Merida: I didn't ask her to change you into a bear! I just asked her to change... you. King Fergus: [Fergus sniffs the air] Something's not right. Merida: There's no use having a go at me. The witch is to blame! Merida: If you had a chance to change your fate, would you? King Fergus: [from trailer] The ancients spoke of it. It is the heart of this fierce land. it is carried in the wind. Born of our legends and when we are put to the test, it is the one thing that we must always be. Queen Elinor: Well, go and fetch it, then. Queen Elinor: A bow, Fergus? She's a Lady! Young Merida: I saw a Will O' the Wisp! Queen Elinor: A Will O' the Wisp? You know, some say that Will O' the Wisps can lead you to your fate. Merida: [Merida looks at the black berries] Find these berries down by the creek, did you? Merida: Where did you get this water? It's got worms! King Fergus: [to Mor'du] I'll fight you with my bare hands!